When you register at robertharding.com, you will be automatically registered on the Robert's Reward programme. You will be awarded 1 point for every £1/$1/€1 that you spend in a single transaction and these points can be redeemed for gift vouchers or discounts off future purchases. 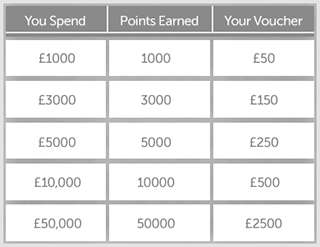 You will need to collect a minimum of 1000 points before you are able to claim your vouchers or discount. So you've earned at least 1000 points. What next? Well you can either continue to collect points by purchasing our images and videos or you can redeem your points. If it's the latter, head over to the "My Account" page. You'll see in your Account Summary that you've made Robert happy! Click the "Redeem Points" button and we'll be in touch with more details about claiming your vouchers. Want to check the small print? Click the button below and we'll send you a PDF with all the details.